A healthy, sweet and savory twist on the classic picnic salad made with Greek yogurt and fall flavors. 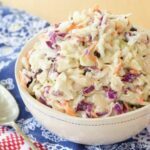 Maple Dijon Apple Coleslaw is a healthy coleslaw recipe with a sweet and savory twist on the classic picnic salad. 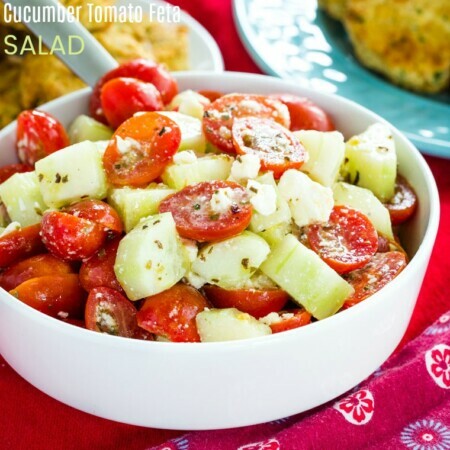 The creamy dressing is lightened up with Greek yogurt for a coleslaw without mayo. Apples, dried cranberries, and maple syrup add a bit of fall flavor, but you can enjoy this quick and easy side dish at a barbecue or party any time of the year. 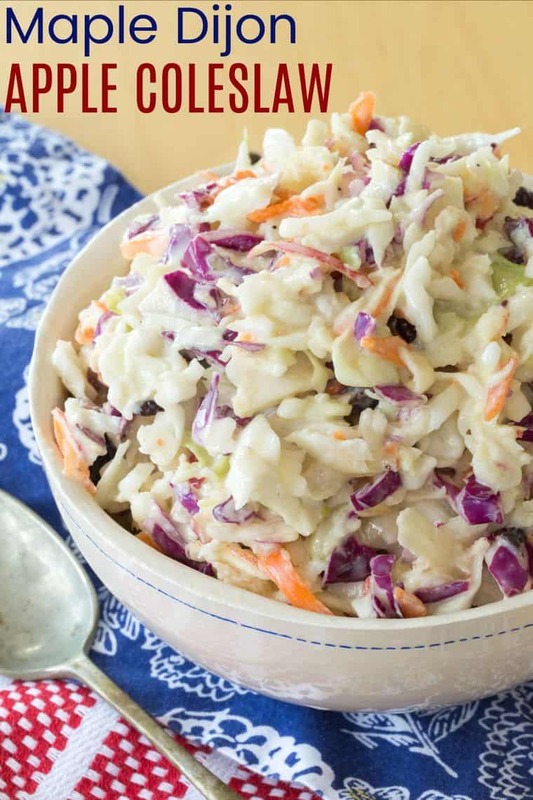 And when the kiddos gobble it up, you know it’s gotta be the best coleslaw recipe ever. Shredded or spiralized apples add that juicy, fresh taste and dried cranberries are sweet tart chewy little bits to add a different texture to the crisp cabbage in this Maple Dijon Apple Coleslaw recipe. Toss everything in a tangy maple Dijon dressing and you have a tasty and unique twist on the classic cole slaw recipe. Plus, it’s lighted up with Greek yogurt instead of mayonnaise, so it’s a healthy veggie side dish that doesn’t become a calorie bomb like your typical cole slaw. 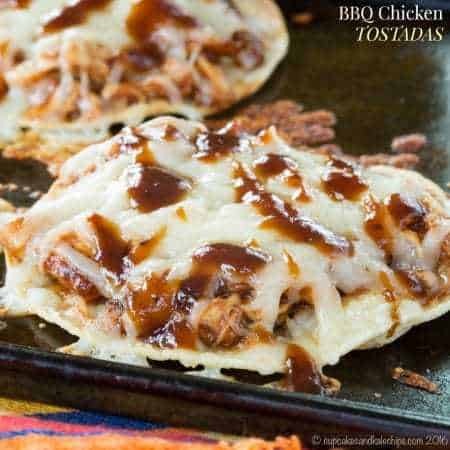 It’s perfect for summer picnics and fall tailgating with pulled pork, barbecue chicken, or even some bratwursts. The Hubby is definitely not what I would call a picky eater. He would be happy living on meat, chips, and chocolate, and certainly wouldn’t mind if he didn’t have to eat vegetables, but he does actually enjoy a wide variety of foods, cuisines, spices, and all of that. And even if something isn’t his favorite, like green beans, he will eat it to set a good example for the boys. But there are a few things where he basically acts like a toddler. Let’s talk soup. Soup is not a meal. Soup may be considered a side dish as long as it goes along with a hearty Barbecue Chicken Sloppy Sandwiches or, you know, a big steak, then I can serve him a small bowl. However, even if I am only serving it as a side, he still gives me a look of frustration or disappointment before even trying it. It if is a broth-based soup like Avgolemono Greek Chicken Zoodle Soup, he’ll basically eat the “stuff” out of it and push the broth aside, and if I ladle too much of a heartier Chicken Corn Chowder in his bowl, he won’t finish it, and, after looking like he is being tortured, he’ll always say, “Well, it’s okay, but I’m not really a soup person.” On a number of occasions he has actually, really liked my soup, especially my butternut squash soup, yet the next time I make soup, he pretty much expects that it’ll be terrible. And when I try to serve a vegetarian meal, look out. No joke, he will eat some, tell me he has had enough, and then will go looking through the fridge for some pepperoni or lunchmeat or leftover roast chicken. He had banned Brussels sprouts from the house, though I eventually overrode that, though I cannot make him eat them. And spaghetti squash is only acceptable if he has a hunk of bread to go with it. That is, until I made this Maple Dijon Apple Coleslaw. I totally expected that I would be the only one eating it, but all of my boys enjoyed this sweet and savory, creamy and crunchy slaw recipe with some of the best tastes of autumn. The little guys actually ate three helpings, and The Hubby said it was really good. Considering it’s cabbage, that’s a major compliment. Of course, the next time I made Maple Dijon Apple Cole Slaw, he picked at it and said it was only okay. But the boys once again devoured it, so I am calling it a win. And I bet this Maple Dijon Apple Cole Slaw will convert the so-called cabbage-haters in your house too! You can shred your own cabbage or use a bagged cole slaw mix. All green cabbage or a mix of red cabbage and green cabbage is fine. I usually grate my apples because it is quicker, but for a bit more of a crunch texture, you can also use a spiralizer, then cut the apple spirals into smaller pieces. The kids love this. If you don’t have dried cranberries, raisins or golden raisins are great too. I prefer to stir together the dressing in a small bowl, mix the slaw, apples, and craisins in a large bowl, then pour the dressing over and toss it all together. Please please please use real maple syrup, not just pancake syrup. It truly adds to the flavor. If you like your coleslaw crisp, serve it right away, but it will keep for a few days in the fridge if you don”t mind a softer texture. 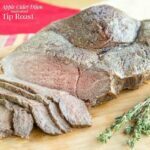 Apple Cider Dijon Marinated Tip Roast is an easy, lean beef roast that has some of the same flavors as this cole slaw recipe. 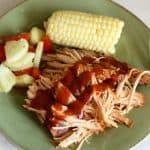 Slow Cooker Root Beer Pulled Pork is a simple way to make flavorful pulled pork to enjoy that classic summer barbecue and slaw combo. Slow Cooker BBQ Rubbed Turkey Breast doesn’t take much effort to make moist and flavorful turkey to pair with your coleslaw. 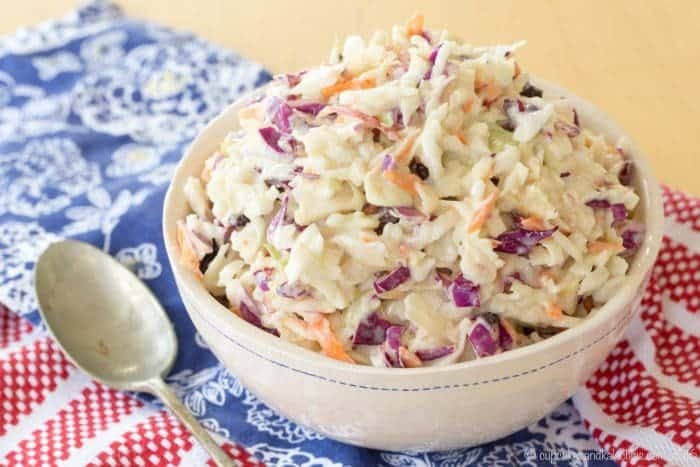 My family thinks this is the best coleslaw with it’s combination of sweet and savory flavors, plus crisp and creamy textures. And you don’t sacrifice any of the creaminess when you use Greek yogurt instead mayonnaise to make a healthy coleslaw without mayo. If you love it as much has we do, I hope you’ll leave a comment and give it a FIVE STAR rating or share a photo on this pin on Pinterest! In a medium bowl, combine the Greek yogurt, mustard, maple syrup, vinegar, salt, and pepper, and stir until smooth and combined. In a large bowl, toss together the cole slaw mix or cabbage, apples, and dried cranberries. Pour the dressing over the slaw and stir to distribute evenly. Store in the refrigerator until ready to serve. Will keep for a couple days, but it will get softer and less crunchy. 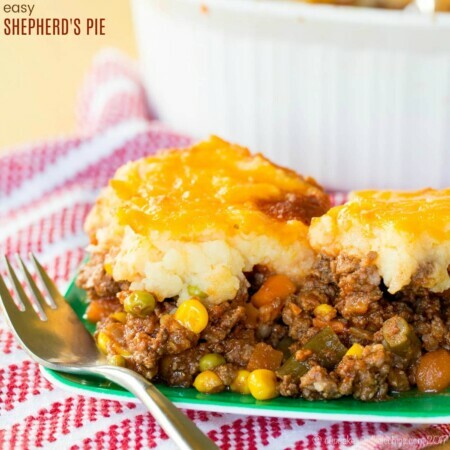 I love this recipe so much that I featured it on my blog. Of course, I would love it if you’d share it! Thank you for your lovely creation. I hope you have a fantastic day! 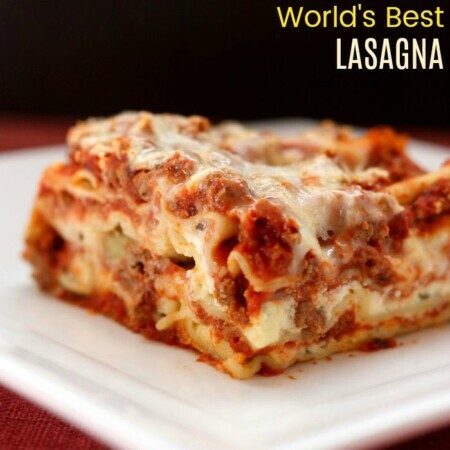 Thank you for including a link to my recipe, Rebecca! Your hubby sounds like mine….lol. He hasn’t banned anything from the house yet, but he hates when I make anything that doesn’t include a huge slab of meat. I think he would love his slaw in a meaty burger. This is such a flavorful spin- I love it! This looks great! We love coleslaw, and I really love the idea of apple in it – YUM!